The Seattle City Council has voted not to renew its contract with Wells Fargo, in a move that cites the bank's role as a lender to the Dakota Access Pipeline project as well as its creation of millions of bogus accounts. As a result, the city won't renew its contract with the bank that expires next year. The unanimous vote will pull more than $3 billion in city funds from the banking giant, the council says. The city says the bidding process for its next banking partner will "incentivize 'social responsibility.' "
After Seattle's council acted, the California city of Davis took a similar action, voting to find a new bank to handle its roughly $124 million in accounts by the end of 2017. On the same day the two cities moved to leave Wells Fargo, the U.S. Army Corps of Engineers granted an easement allowing the Dakota Access Pipeline to cross under the Missouri River north of the Standing Rock Sioux Reservation. As NPR's Rebecca Hersher reported, that agreement would clear the way for construction of the final 1.5 miles of the more than 1,700-mile pipeline. "Protests in Seattle against the Dakota Access Pipeline project have been large and frequent, often organized by local tribal members," member station KUOW reports. "Protesters, many of them Native people from Washington state, share the concerns of the Standing Rock Sioux Tribe, which says the pipeline would threaten tribal water supplies, land and cultural sites." San Francisco-based Wells Fargo has been in the headlines since last fall over a scandal involving accusations that the bank's employees created fake accounts in its customers' names to bolster performance results and boost bonuses. While other banks are also involved in the pipeline deal, Wells Fargo's recent history seems to have helped make it a target once again. Seattle's plan to stop its dealings with Wells Fargo comes months after the city canceled a $100 million bond deal between its electric utility and the bank. That took place last fall, when the treasurers of California, Illinois and other entities said they would freeze their dealings with the bank — in some cases, for a one-year period. 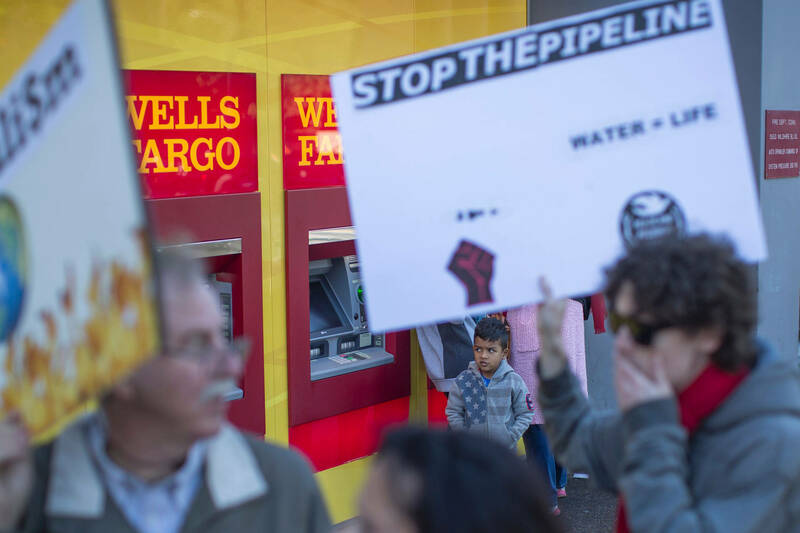 Wells Fargo's commercial banking manager for Washington state, Mary Knell, tells KUOW that she's disappointed in Seattle's new move, noting that the bank is bound by its contract with the pipeline project. Knell tells KUOW that the bank has "enhanced our due diligence on projects such as this to include more research into whether indigenous communities are affected and that they have been properly consulted." Socialist City Council member Kshama Sawant, who spearheaded Seattle's move away from Wells Fargo, says a rally against the bank is scheduled for this weekend. And after noting that Wells Fargo is "one of the six primary financiers of the for-profit private prison industry," Sawant ended a statement about the bill's initial passage earlier this month with a note of caution, saying, "All of the big banks are terrible, and, as long as we have capitalism, our contracts will be with institutions that put corporate greed over human need." Days before Seattle held an initial vote on divesting from the bank, Wells Fargo announced it will donate $500,000 to five of the city's nonprofit groups that work to revitalize Seattle neighborhoods. When Seattle City Council member Debora Juarez spoke of voting against Wells Fargo, she repeatedly cited a need for integrity — even as she acknowledged the small direct impact Seattle's move will likely have. "For a company whose deposits totaled more than $1 trillion last year, it's a drop in a very big bucket," Juarez said. "But for Seattle, a city whose budget is approximately $4 billion, voting to withdraw our funds -- money that covers the biweekly payroll of $30 million for about 12,000 employees -- is an opportunity to send a message." In Davis, the city's report on the possibility of cutting ties with Wells Fargo noted that Philadelphia and Minneapolis are also considering the same move. "It's not clear which financial institutions the city will work with in the future. More than a dozen other banks are connected to the pipeline, including CitiBank, ING, Chase and Bank of America. "City Council members including Sawant, Mike O'Brien and Lisa Herbold are interested in contracting with a credit union or state-run public bank. Both of those options, however, would require a change to state law." In addition to complaints about the pipeline and its business practices, Wells Fargo was hit with a lawsuit at the end of January that accused the bank of "illegally denying student loans to young immigrants who are protected from deportation and allowed to work and study in the U.S. under a program created by former President Barack Obama," as member station KPCC reported.